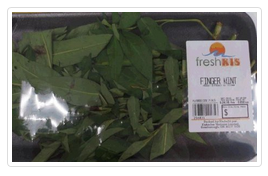 Ottawa, October 13, 2015 - Kiskadee Ventures Limited is recalling freshKIS brand finger mint from the marketplace due to possible Salmonella contamination. Consumers should not consume the recalled product described. The following product was sold at Real Canadian Superstore, 3050 Argentina Road, Mississauga, Ontario.